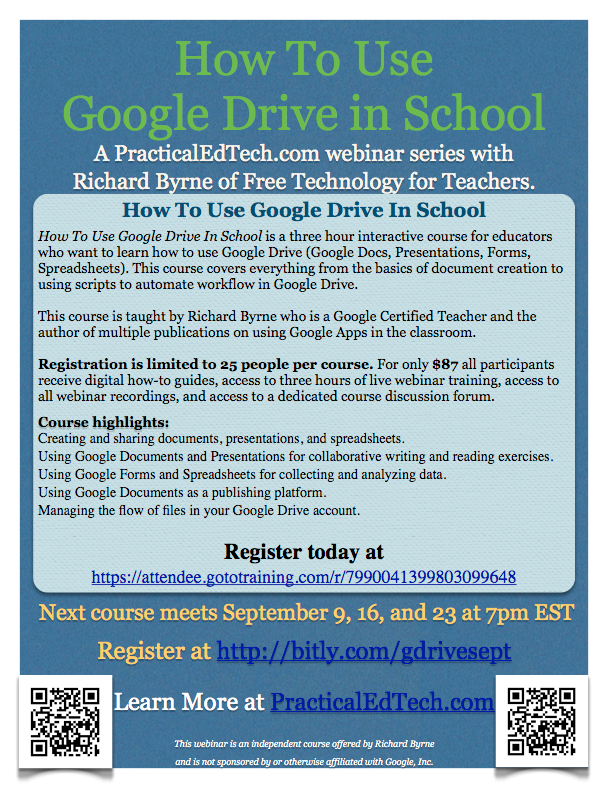 How To Use Google Drive in School is a three part series designed for teachers and school administrators that are new to using Google Drive. I offered this course in four times earlier this year and it sold out each time. This fall I'm offering the course on September 9, 16, and 23 at 7pm Eastern Time. The course covers everything from the basics of creating documents, presentations, and forms to advanced uses of scripts in Google Spreadsheets. The cost of the three part course is $87. While the webinar series is not free it is significantly less than cost of flying me to your school for the day or the cost of attending one of the Google Apps Summits. Click here to register. *All sessions are recorded and every participant can download the recordings. *All participants receive digital hand-outs that they can download and share within their schools. Payments can be made with a personal credit card, with a school district credit card, or with PayPal when you register online. Checks and purchase orders can be accepted however the cost of registration is $15 higher to cover additional processing associated with those payments. Please contact me directly at richardbyrne (at) freetech4teachers (dot) com with questions about course registration and or payment processing.